The former head of Israel’s spy service has launched an unprecedented attack on the country’s current government, describing it as “irresponsible and reckless”, and has praised Arab attempts to reach an Israeli-Palestinian peace agreement. Meir Dagan stepped down as the head of Mossad six months ago but has gone on the offensive in a series of briefings with journalists and public appearances because he feels that Israel’s security is being mismanaged by Binyamin Netanyahu, the prime minister, and Ehud Barak, the defence minister. One newspaper quotes him as saying that he, as head of Mossad, Yuval Diskin, the head of Sin Bet – the internal security agency, and Gabi Ashkenazi, the head of the army, could prevent Netanyahu and Barak from making mistakes but all three have left their positions and have been replaced by men chosen by the current government. “I decided to speak because when I was in office, Diskin, Ashkenazi and I could block any dangerous adventure. 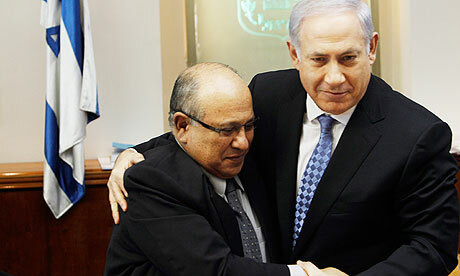 Now I am afraid that there is no one to stop Bibi [Netanyahu] and Barak,” said Dagan. The absence of any workable plan, he said, will leave Israel in a dangerous and weak situation if the Palestinians push for UN recognition of a state later this year. Ben Caspit of the Maariv newspaper wrote: “He is one of the most rightwing militant people ever born here … who ate Arabs for breakfast, lunch and dinner. Dagan was quoted in the newspaper Yedioth Ahronoth describing Netanyahu and Barak as “irresponsible and reckless individuals”. Dagan’s criticism of Netanyahu comes when the prime minister is enjoying popular support following his trip to Washington and his speech to Congress. Opinion polls suggest that Netanyahu has a nine-point lead over his nearest challenger and his Likud party is the most popular in the country. However, Dagan’s intervention suggests that while Netanyahu is seen as an able performer in public, he believes that behind the scenes he is less astute. A spokesman for the prime minister said that he would not discuss Dagan’s comments. However members of the cabinet told the Israeli media: “Dagan was out of line on the Iranian issue. This damages deterrence, because the military option must be on the table as a credible option after sanctions. “If you come and say, ‘we can’t attack Iran, it’s impossible,’ you project weakness to the Iranians and make it look like you don’t have the courage to do it, and that they can do whatever they want. Thank you, Meir Dagan, for saying what everyone knows – that continued aggressiveness against Iran is not only unneeded for Israel’s security but in direct opposition to Israel’s security. Israel has had nukes since the early 1970s, so Israel has NEVER been in ANY danger from Iraq OR Iran, even if they’d developed nuclear weapons since MAD would assure that neither Iran nor Iraq would commit suicide. Indeed, since Iran announced in mid-July 2008 that it had acquired the ability to destroy Israel in five minutes with conventional missile capacity, it’s been (as the kidz say) “all good.” McCain stop singing songs about bombing Iran derived from the 1950s song Barbara Ann (and if he’d been dumb enough to continue, Joe “Mr. Ed” Lieberman would have come up to him, whispered in his ear, and said “YOU GOYISCHE PUTZ, SHUT UP!! !”), oil prices which had skyrocketed from $100 at the beginning of 2008 to $147 by mid-July suddenly plummeted down to $90 within six weeks since the US was no longer going to endanger Israel with talks of attacks on alleged Iranian nuclear underground development which could be misinterpreted by the Iranians as a full-blown nuclear attack on Iran (remember the Vicennes incident? US software that couldn’t tell a big jumbo jet from a small fighter jet?) which would result in the end of 99% of Israelis if Iran decided then to attack Israel, and 90% of Iranians after an Israeli counterattack. In other words, since mid-July 2008, even though Ahmadinejad could follow through on his ALLEGED belief in wiping out Israel, he sure hasn’t followed through, has he? Bibi sure impresses the women and dumb Americans since he was raised here and sounds like us, but he sure is dumb.